This issue is released to the echoes of the announcement of “Plan S” from Science Europe. 11 European funders, including UKRI, have signed up to a robust and game changing set of principles for scholarly communications, with the Plan saying “. . . the subscription-based model of scientific publishing, including its so-called ‘hybrid’ variants, should therefore be terminated” and calling for CC-BY, non-embargo availability of all publicly funded research outputs. Some have seen Plan S as a purely “gold” plan and a diminution of repository-based OA. But far from it. Repositories guarantee access; especially pertinent in a month when De Gruyter access to some of their OA journals has been withdrawn, triggering Portico arrangements. In a “Plan S” world of CC-BY material, repositories have a central role in gathering material and facilitating overlay journals, TDM, meta-analyses, AI crawling, cross linkage to data, new forms of publications, etc. In a “Plan S ” world, repository use will go up through the roof. For Jisc? We will, of course, respond to sector developments and our members’ needs, but we think we are in good shape for whatever lies ahead. Policy clarification, APC costs tracking, routing OA material into repositories, PID support, publisher deals and negotiation: all of these will be even more important in a fully OA world. Router is now in live use by 36 institutions. Two of these are pilot DSpace users, and once we have a clear sense that the interoperability is indeed meeting their needs well, we will invite DSpace-using HEIs more generally to take up the service. In recent months, the service has typically pushed around 3000 article notifications per month into HEIs’ open repositories. Positive conversations with new publishers continue, including advanced and detailed discussions with an OA publisher (which says it will supply full text in published version of record, VoR), a large multi-disciplinary publisher (early accepted manuscripts, AMs), two major learned society publishers (initially OA content, subscription content to be added later), two very large publishers (one of which will supply metadata only, the other AMs) and a further STM publisher (AMs of subscription content). Most of these have supplied sample files, including full-text, for testing purposes. Some appear to be making significant adjustments to the details of their workflow to accommodate Router. If these go well, we are hopeful that some of them will progress to live feeds soon. We continue to pursue interoperability with the major CRISs, extending our investigations into multiple alternative options. The recent report of the UUK repositories working group urged CRIS vendors to “fully integrate” with Publications Router. One of the them has approached institutions with a view to piloting an innovative approach to ingesting feeds from Router into their system; we will support that as much as we can. We are busy developing Sherpa RoMEO and are on track for releasing a limited beta of Sherpa RoMEO v2 in October. This is part of our service improvement programme, which aims to update all Sherpa services to provide the community with a set of agile services better placed to respond to the increased complexity in today’s open access landscape. After this we aim to continue our plans to integrate Sherpa RoMEO with technologies like the Elastic Stack to allow us to put state-of-the-art search, reporting and visualization tools on our service endpoints. We now have 25 institutions signed up to Monitor services, with others currently trialling the system, and are continuing to develop the services in response to feedback and requests from our users. A number of new updates to Monitor Local have been released over the last couple of months, bringing new functionality including the Jisc APC (TCO) report export and import tools, and most recently v1.13 of Monitor Local brought in an ‘export all’ feature, allowing institutions to export a spreadsheet containing all of their records within a particular entity (i.e. all Academic Outputs, all People records etc). Development work is moving quickly, so the next update to Monitor Local (v1.14) will be deployed within the next few weeks. This will include an improvement to the process for recording cost paid status & date, usability enhancements such as saving via keyboard shortcuts and back-end/support improvements. We have also been doing a lot of work on Monitor UK, which will soon be re-launched with a new user-friendly interface and easy to read charts. More information on this will be available soon. If you are interested in finding out more, trialling the system or receiving a demonstration of Monitor Local &/or Monitor UK, please do get in touch at help@jisc.ac.uk. Jisc has set up a dynamic purchasing system (DPS) to enable New University Presses (NUPs) and Academic Led Presses (ALPs) to contract with suppliers that offer publishing services, especially in support of open access. The DPS will enable NUPs and ALPs to see which suppliers provide publishing services and exactly what the services are that are offered, enter into contracts safe in the knowledge that Jisc has negotiated specific terms that offer security, benefit from knowing that the suppliers in the DPS have passed a set level of entry requirements and meet procurement regulations. Supporting institutions in the adoption and implementation of open access in line with funder requirements is a core strategic aim of Jisc. Jisc’s Changing publishing ecologies landscape study showed that there is significant activity being undertaken by institutions to publish and disseminate open access content through NUPs and ALPs. These presses are often using or seeking to use external services to support the publishing process. But understanding what services are available from suppliers, or even who those suppliers are in the first place can be time consuming. In addition, there is no comparison of services, or ways to evaluate the value of the supplier’s offers. A lack of transparency over contractual terms, fees and service levels also creates additional risk. Jisc aims to resolve these issues through its dynamic purchasing system (DPS) which offers NUPs and ALPs a transparent, secure and procurement compliant route to contract with the suppliers of publishing services in order to enhance the availability and dissemination of scholarly content and a sustainable research infrastructure. Publishers include in their invoices all cost and licence related metadata: DOI, funder and licence information, author names and affiliation, funder identifiers and ORCIDs. The project builds on the recommendations issued in the Knowledge Exchange report as well as in reports issued by ESAC and EUA. It aims to look at a small set of publishers’ contracts clauses and at the metadata they provide to consortia to assess if they are effectively providing the metadata agreed as well as if they meet the recommendations made in a selected number of reports (Knowledge Exchange, ESAC, and EUA). As a result, the working group will create a detailed list of recommendations for publishers that can be used by all Knowledge Exchange countries in licensing negotiations as well as in monitoring agreements. By doing so, consortia from the six Knowledge Exchange countries will be empowered to advocate for publishers to provide their metadata in a more standardised way across countries. The number of Institutional Repositories (IRs) participating in IRUS-UK has reached 142 (by August 2018), representing >94% of eligible IRs. Fairly comprehensive coverage provides a virtually UK wide view of IR usage and supports national comparison and benchmarking. Two recent developments have exploited the use of ORCIDs and CORE to offer enhanced functionality. By harvesting ORCIDs (where they’re being exposed through RIOXX records) and incorporating them into IRUS, participating repositories can now uniquely identify and disambiguate authors and downloads of their research using their ORCID ID rather than by name alone. For repositories that participate in IRUS and have content harvested by CORE, a new report supplements the regular number of item downloads with a figure indicating usage of corresponding items downloaded from CORE. The current 3 year licence completes in December 2018. The new membership pricing was communicated to current members in June 2018. The technical support and community engagement staff/activity has been subsidised by Jisc project funds since August 2015. We needed now to ensure ORCID consortium was a viable concern beyond 2019 and that it was cheaper to go through Jisc consortium Currently we have 92 members. The new membership pricing will take effect from January 2019. We ensured that all members who had an integration had moved to the updated API (2.0) before the end of July 2018. There will be a move to 3.0. (see blog post below). We had our annual ORCID members meeting at the end of June, the summary can be found here. We are now planning more events and training for members for the year ahead for the Collect and Collect initiative, Self Service, API training and hackdays. Jisc maintains a close watching brief in the Open Access discovery environment, including gathering information about the discovery options that are available, and what the future may look like in this space. We are looking to develop a future engagement strategy with other organisations operating here by determining how future positive interventions can be best made. We do believe, however, that a huge amount could be achieved through a programme of interventions that led to persistent identifiers being used better. Persistent identifiers (DOIs, ORCIDs, ISBNs, etc) are the signposts in the research landscape. Where they are used well, then OA discovery is relatively easy. However, PIDs are not always used well, and often are not used at all. This is for a variety of reasons, most of which are tractable via a combination of technical, cultural and organisational interventions. For both aspects of our work in this area, we are assessing our option and look forward to sharing more information on this in due course. CORE/ Journal Archives: We have been investigating the opportunities and analysing options for a possible Jisc-delivered text and data mining (TDM) service across two existing Jisc services: CORE and Journals Archive. These two platforms already deliver significant amounts of digital content, in the form of scholarly articles, and their combined corpus could immediately facilitate new research opportunities and lines of enquiry if text mining techniques were applied to it. A mechanism allowing users to define and create their own, task-specific corpora from a ‘pool’ dataset created from CORE and Journal Archives. A workflow environment in which corpora can be interrogated and processed using TDM components from an available toolkit. To begin with, this range of tools will be limited and will concentrate on providing those most widely-used. Training materials and helpdesk assistance, as well as mechanisms to share experiences and best practices, in order to encourage and support a community of practitioners. We are currently assembling a detailed project plan for the JGTDM prototype – mapping workstreams to tackle a number of distinct areas, such as evaluating and detailing the technical solutions proposed above, prioritising the TDM tools that need to be included in the initial deployment of this service – but look forward to keeping you updated as work progresses. For more information, see this blog post. OpenAIRE2020 officially concluded on the 30th of June 2018, but that doesn’t mean that its services and support for Horizon 2020-funded projects has stopped. OpenAIRE Advance continues with much of the work of its predecessor and is striving to do more to engage with its sister project, OpenAIRE Connect, both of which engage with the European Open Science Cloud, or EOSC. We plan to run a webinar either near the end of 2018 or early 2019 to help UK repositories comply with the new OpenAIRE guidelines. In addition, non-UK open repositories, which want to be registered in Jisc’s OpenDOAR, can easily do so by going to the new site; make sure to click the button that lets us know that you intend to join OpenAIRE. We are also hoping to offer a workshop covering aspects of OpenAIRE Advance in 2019. 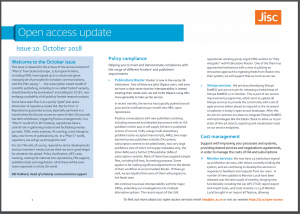 We will be reviewing policy requirements with the newly formed UKRI and Research England and what impact this may on future OA metadata collection and the RIOXX application profile. Our OA summer series in July proved to be popular, with over 120 attendees over the four events. We will shortly be sharing a summary of the discussions that took place. Posted by Helen Blanchett on October 1, 2018 in OA digest.